Samsung has been rumored to introduce a round faced smartwatch of its own for some time, however new information has surfaced suggesting it could come in three variants. 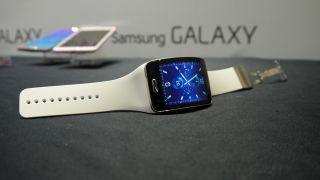 Sammobile reports the Samsung Gear A may well come in three flavors named the Orbis S1, Orbis S2 and Orbis Classic. The possibility of trio of wearables could be attributed to three different internal codenames (SM-R720, SM-R730, and SM-R732) that a Samsung source shared with Sammobile. If the source is right, this could mean Samsung means to mirror Apple's strategy of offering the Apple Watch in multiple versions. It wouldn't be a stretch to imagine the Korean electronics firm also has plans to offer multiple versions of the Gear A made with different materials, strap options and functionality. Samsung has been slowly releasing official details of a new round wearable, which first started in May when the company released an SDK for such a device. The Korean electronics firm later confirmed the Gear A smartwatch would feature a rotating crown that serves a few different functions like app selection and scrolling. Unconfirmed reports also suggest the Gear A will come packing a circular Super AMOLED display with a resolution of 360 x 360 pixels with an Exynos 3472 processor at the heart of the device. The smartwatch could also be equipped with 768MB of RAM, 4GB of onboard storage, a heartrate monitor, 250 mAh battery and cellular connectivity (similar to the Samsung Gear S). We could see the Orbis/Gear A very soon indeed as Samsung plans to hold an Unpacked event August 13 – where we're already likely see the Galaxy Note 5 and Galaxy S6 Edge Plus.